I do a lot of online research for both my writing and my engineering jobs, simply because the information on the internet is readily accessible, fast, and in some cases, accurate. Recently I did some research on a power supply design for a project at Vertex Electronics. Starting with a basic Google keyword search, I marched down the screen, clicking on results that appeared relevant to my design goals. I selected a link containing information about a 12 volt dual power supply and waited eagerly for the page to load. The page finally popped up, and smack dab in the middle of the screen, between the lead paragraph describing the benefits of a +/-12 volt DC power supply and a description of a 14-0-14 volt step-down transformer, sat a photo of a woman dressed in nothing but a few twists of leather, a pair of black high heels, and a large helping of my imagination. She seemed to be contorted into some pleasantly painful yoga move, dark blonde hair cascading over her face. “What the—?” I gasped. “TMI! What does this have to do with power supply design? !” Granted, her design was, well, electrifying (don’t judge me), but the prominent position (of the ad . . . ) was extremely distracting. After several minutes I managed to read the actual content of the website (all twelve words), but the experience left me feeling . . . dirty, like I had to go home and confess to my wife. These kinds of non sequitur ads are all over the place now—they pop up like Donkey in Shrek—“Pick me! Pick me!” It reminds me of that movie, The Fifth Element, where ads crawl across the walls of buildings and on shop windows as people walk by. The Fifth Element was set in the future, but it didn’t take long at all for that kind of future to arrive. Good grief! 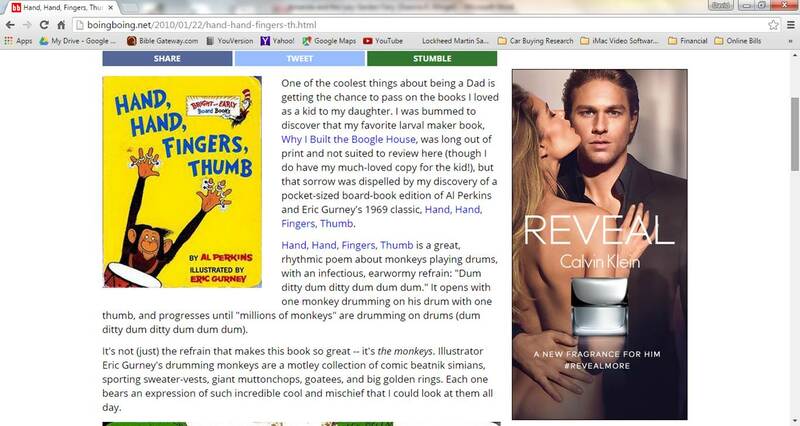 Once, while looking up commentary on Dr. Seuss’ Hand, Hand, Fingers, Thumb, I practically fell out of my chair when a racy ad for Calvin Klein’s “Reveal” fragrance popped up right next to the article I was searching for. The ad featured a completely naked woman kissing a completely clothed man with a weirdly puzzled look on his face. I think his expression reflected mine exactly—“Why does he still have his clothes on?” I wondered. The other day I found a website chock full of information on HTML, the web page programming language. After a few minutes I realized how distracting the site was going to be: the content frame was surrounded by colorfully-animated pop-up ads, no less than four at any given moment. All the ads moved, flashed, and cavorted on the screen. Each time I selected a new page a fresh set of ads appeared. “These guys are clever,” I declared to my boss. “Every time my eyes detect movement, they jump from the content to the ad. I hate these people. I wish they would all die.” I’m sure it took me at least twice as long to learn what I needed from that website—instead of helping me be more productive, the internet is now morphing me into a twitchy merchandising target with an attention span the length of a nanotube. Hooray for free enterprise. Good thing the computer has an OFF button and Amazon still sells real books fashioned out of paper and ink instead of Calvin Klein ads. For months I’ve been grumbling about the pop up ads on my Yahoo! email inbox page. “No, I don’t want a girlfriend aged 50 plus!” I scream at my computer. “No, I don’t want to save $1.50 on my next purchase of Preparation H Medicated Wipes for Women!” I yell, shaking my fist. “All I want to do is read my freakin’ email. That’s it. Just . . . read . . . my . . . email . . . .” Of course I can’t get rid of those ads because I’m using Yahoo! mail for free, but I’m paying for it every day. If something’s free, I’ve learned, it may not necessarily be worth anything. Remember the good ol’ days, when we actually wrote letters? On paper? With a pen? Letter-writing was truly an art form executed with deliberateness and abounding in love. Not long ago I would spend an hour or two every month writing letters. Now it seems a significant part of my day is wasted just deleting the plethora of emails asking me to send money to help repatriate a friend who’s stuck in Outer Mongolia. And having two email accounts doesn’t help. Neither does having the ability to access email on my cell phone. Now even precious bathroom time is spent deleting junk emails rather than reading the latest issue of Field & Stream. And that’s not even saying anything about Facebook . . . .
What’s that old saying, “If you can’t beat ‘em, join ‘em?” Believe me, I’m trying to join ‘em, but this old 8-bit brain still processes information like a Tandy TRS-80 rather than a Tianhe-2. Gone are the days of just sitting down to write . . . and writing. But, who knows, maybe sometime in the future one of my pop-up ads featuring a scantily-clad woman seductively holding up The Epiphany of Joy will hit your screen and you’ll buy a copy. Then the griping will have all been worth it. In the meantime, please excuse me. I see I’ve got 43 Facebook reminders, 372 new emails, and 12 LinkedIn notifications to respond to. Not to mention President Obama wants me to refinance my house. Can’t waste any more time actually writing. . . .
Hey, David! What a great post! I just wrote a similar post. Well, kind of the same. I agree that all this “connectedness” is exhausting. I love the access that technology gives us, but there are definitely trade-offs. These days a person has to deliberately “unplug” in order to have the peace needed to take a break and think one’s own thoughts – what a concept! Hi, Diane! Yes! I love what you said about “the shrinking attention span of society in general.” Mary and I seem to spend a large part of the day telling our daughter she can’t play on the iPad, iPhone, computer, etc. etc. We’ve struggled with getting her to focus on the fresh air and sunshine and have tried hard to instill in her an appreciation of the simpler things in life. Then I go off to work and immerse myself in the internet 7 out of 9 hours a day, it seems. All in the name of living out my calling, mind you! Thanks for sharing and please keep in touch. Focus, focus, focus!